Synopsis: When Jacob Portman was a boy, his grandfather regaled him with stories of his fantastic life at Miss Peregrine’s home during the Second World War, even sharing photos of the remarkable children with whom he resided. As Jacob grew up, though, he decided that these photos were obvious fakes, simple forgeries designed to stir his youthful imagination. Or were they…? Although I loved this graphic novel, I kind of hated it too. Well, hate is a bit of a strong word. But there were things about it that just…annoyed me. 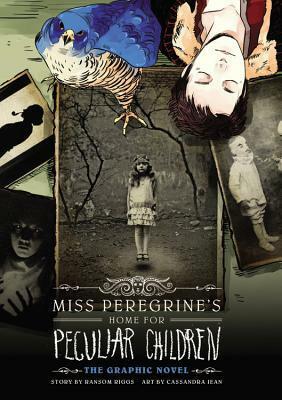 Basically, I read the novel edition of Miss Peregrine’s late last year, and I loved them. But the thing I found is there is no “filling out” in the series. Most of the pages are needed to help you feel close to the characters and understand what’s happening at all times. And because this book is so unique, when you take away some of those pages…it’s pretty hard to grasp. The plot is complicated, with twists and parts that are hard to describe in few words. So compressing it into speech bubbles and pictures doesn’t really work, in a way. Well, it only does (in my humble opinion) if you’ve read the novel first. But…if you have read the novel first, it’s amazing! As I already knew all of the characters and the plot, this book just made me feel even more immersed in the story. And the illustrations are insane! Jean has some crazy skill there – and it’s really used well in this graphic novel. Both her and Riggs’ skill combine to make this book…a peculiar kind of beautiful. So overall, I would definitely recommend this! I would just also recommend that you read the novel first (or maybe watch the movie when it’s released!). I had no idea there even was a graphic novel! Well I guess I was better off anyway! I’m looking forward to the movie adaptation! Me too!! It’s going to be amazing! Especially directed by Tim Burton who is my favorite director!